Great books you got. There are so many really amazing books there. Hope you enjoy reading all your books. Wow, you got a LOT of amazing books! I hope you'll enjoy them all :) Happy reading! How was you trip to Israel by the way? Wow, what a super massive mailbox and congrats on winning the Debut Author Challenge! WOWZA! So many wonderful books :) Make sure to read Defiance soon - that one was brilliant. Wow, awesome week!! You've got some brilliant looking books there. WOW! You got some awesome reads this week! And tons and tons and tons of swag! You're so lucky! @Erica, I hope to read Defiance soon, I love the Strange Angels series SO MUCH! Awesome book haul! Congrats on winning the DAC from April. You got a lot of great stuff, and I hope that you enjoy it. Happy reading! I'm so jealous! You got an awasome mailbox this week! Congrats on winning the DAC for April! You got so much! I'm so jealous! I want to read The Goddess Test so bad and I got Imaginary Girls this week too! I hope you enjoy all you got! Here's My IMM if you want to check it out! Happy reading! Wow! What a great lot of books. The Debut Author prize pack is awesome! Lots of reading for you to do! awesome haul!!! so jealous, so many good books you've got that I'm dying to read!!! Great set of books and swag! I especially want to read Beauty Queens and Entwined. I don't know where to begin... So many of those books are on my TBR list. Hope they live up to the hype! And where do you even begin reading with a list of books like that?? You were so lucky to win that pile of amazing books and swag. You'll be reading for quite some time. Hope you enjoy them all! I really liked the gritty feel of Darkness Becomes Her. Nice mailbox this week. 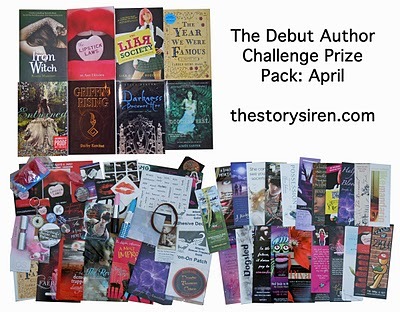 Not only did you get a lot of books this month but a ton of swag too. wow that's awesome that you won all those books! Thanks for stopping by my blog. I'm looking forward to your reviews.